Minnesota lived up to its billing. 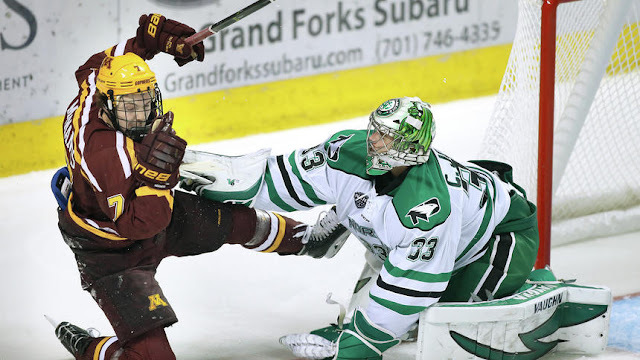 The Green and White played incredibly well on Friday, outshooting the Gophers handily, allowing just 18 shots on goal, the first time Minnesota was held under 20 shots in a span of 110 games. However, the Gophers got two transition play goals, one in the first period and the other halfway into the third to pace a 2-0 lead late into the game. UND got a Rhett Gardner goal with just under seven minutes to play to make it 2-1, but that's all they could muster as Minnesota took the opener. On Saturday night, Minnesota upped their game and played better overall, but a power play goal on a five-minute major penalty taken late in the first staked UND to a 2-0 first period lead. The Fighting Hawks tallied twice more on that power play in the early parts of the second and the 4-0 lead held up as UND earned the split. While DDC certainly would have loved a sweep, he'll take a split in two good performances. Here's what stood out to DDC in his Roses and Thorns recap of the series with the Gophers. Regardless of the scores, this weekend was flat out fun to watch. Midco Sports color commentator and former Sioux goaltender Jake Brandt noted a few times in the past handful of weeks that the Ralph Engelstad Arena had lost a bit of its mojo and hadn't been too tough a place to play recently. Well, that went out the window on Friday from the very first shift as UND pushed paced early on and the REA faithful responded. Down the stretch in the front end of the series as the Green and White tried to rally back to tie the game, the crowd was loud and fully involved. Then on Saturday, three goals on on a five-minute major kept the barn rocking. Two good paced games with high energy made things clear -- The Rivalry is back. Cheers to five more consecutive years of this series. While UND fans certainly saw a glimpse of what was to come from the junior defenseman from Detroit down the stretch last season, particularly in the NCAA tournament game against BU, Wolanin has certainly lived up to his stature this season. Wolanin was dynamic against the Gophers with an assist on Friday and two goals in a span of four and half minutes with UND on a five-minute power play to pace the 4-0 win on Saturday. The junior now leads the Fighting Hawks in goals (3), points (6) and shots on goal (23). Quarterbacking the power play, Wolanin had lead UND to a stellar 22% mark. Known for his offensive prowess during his career, Wolanin has been solid defensively, as well as the Green and White lead the nation in goals against, allowing just 1.17 goals per game on the season. It's been a heckuva start for Wolanin. UND lost a senior captain in Gage Ausmus and an All-American now playing in the NHL in Tucker Poolman from last year's blue line, so it was easy to think that the Fighting Hawks would struggle at the outset defensively, this year. However, this has simply not been the case. As previously mentioned, the Green and White lead the nation in goals against (1.17) is second in penalty kill (96.3%) and net special teams (+7). Minnesota has always been known for a dynamic power play that can move the puck and pepper the net with opportunities over the years, but UND simply shut the Gophers down this past weekend killing off all 11 chances down a man. Senior netminder Cam Johnson earned his 10th career shutout on Saturday and is now third in the nation in goals against average (1.16) and 10th in save percentage (.942). As the Fighting Hawks look to find more scoring punch, their blue line is holding up incredibly well. Adding freshman Gabe Bast to the lineup this past weekend proved to be a good experiment as Bast added a tremendous offensive presence. Great start for the blue liners and Cam. Alright, DDC is going to make this short, but Minnesota head coach Don Lucia is officially on this blogger's nerves. Lucia skipped a fan luncheon that has been attended by each visiting coach as long as DDC can remember. This can be dismissed easily as gamesmanship and so be it if that's the case. However, it did not end there. After a tough battle on Friday, Lucia decided to sit freshman star Casey Mittelstadt for Saturday night's game after the rookie took a shove in the lower back area on a net-front scrum. Lucia noted that Mittelstadt was sore and maybe he was just protecting his player. Again, this can be dismissed, but should it be? Lucia noted that Mittelstadt said he wanted to play, but the head coach held him out. To DDC, this is a disappointing move. What is this doing for Mittelstadt? Taking him out of probably the most heated game he's ever played isn't going to help the freshman as he's going to need to play in this type of environment at some point. Let the kid earn his stripes, coach. Well, that wasn't short, but so be it. Thanks for reading, everybody! Comeback for a look at DDC's preview of UND's trip to Colorado Springs as National Collegiate Hockey Conference play beings against the Colorado College Tigers.